In an unusually blunt statement, the Ontario government admitted last year that stormwater management strategies employed in the province have not been working. “The environmental health of many watersheds continues to decline as urbanization increases,” read the Ministry of Environment and Climate Change’s (MOECC) February 2015 ‘interpretation bulletin.’ The trouble, they suggested, was the strategies designed to control the quantity and quality of water runoff leaving a developed site were missing the mark. They were not mimicking natural hydrologic conditions well enough to prevent damage to downstream environments, which is the raison d’être of stormwater management. The bulletin was at once a shot across the bow of industry and a signal of imminent changes to stormwater management regulation in the province. The biggest of these changes was the promise of new, clearer design guidelines which would better align with Low-Impact Development (LID), a movement now reaching a tipping point of popularity in North America. LID is a concept with decades of history and deep roots in Europe and the United States, blooming first in centres like Portland, Ore; Seattle, and Philadelphia. Canada, on the whole, has been slower to warm to LID but now cities like Mississauga, Toronto and Vancouver are playing more prominent roles in the iterative global development of this technology. Fourteen months on from the MOECC’s bulletin, little news regarding the new design guidelines has been offered, and industry anticipation is escalating as the year-end deadline comes into view. Those in Ontario’s urban centres trying to divine what the new guidelines will contain or what impact they may have domestically are turning abroad to comparable early adopters like Philadelphia. There they learn LID’s baggage is a steep learning curve, but, with it comes opportunity for industry to build more desirable communities and pad the bottom line in the long term. Van Seters, a manager of sustainable technologies at the Toronto and Region Conservation Authority has spent the better part of two decades researching stormwater management innovations. Now a part of the TRCA’s Sustainable Technologies Evaluation Program, he reviews LID projects with earnest. At its heart, the LID approach aims to minimize impervious cover, decentralize stormwater control and employ green infrastructure. Instead of one stormwater pond downstream of one community, LID integrates at-source stormwater management features throughout the community as a network of small-scale, attractive amenities, including rain gardens, bioswales, cisterns and green roofs. “Best practices at the time recommended a ‘treatment train’ approach,” he notes, “which included a series of LID and end-of-pipe features to control runoff from source through conveyance to discharge. But the way it was actually implemented through the 1990s and 2000s and really still today was primarily through end-of-pipe technologies, so the other, more decentralized technologies were largely forgotten.” The penchant for end-of-pipe solutions helped proliferate the constructed wetlands and wet ponds we now see accessory to greenfield developments across the province, but as recent monitoring data shows, when employed in isolation, they have performance flaws and do not fare as well as multiple controls in sequence. In December 2015, Neukrug retired as CEO and Commissioner of the Philadelphia Water Department, leaving behind an impressive 37-year legacy and one of the most ambitious big-city water strategies undertaken in the 21st century. The USD$3 billion, 25-year Green Cities, Clean Water plan, signed into law in 2011, set to battle a looming combined sewer overflow problem by reducing the amount of stormwater entering the sewer system entirely through green infrastructure and LID practices. The plan aims to recreate “living landscapes that once slowed, filtered, and consumed rainfall by adding green to streets, sidewalks, roofs, schools, parks, parking lots and more.” When fully implemented in 2036, it is estimated waterway pollution will be reduced by 85 per cent while saving Philadelphia nearly USD$6 billion. Philadelphia’s policy-first approach was initially quite disruptive. “We had a significant problem at first because there were no engineering consultants who really understood how to do this in an inexpensive and efficient manner,” says Neukrug, highlighting the opportunity for consultants to excel in a culture of policy change. Neukrug understands having the entire industry travelling a learning curve together was expensive, but also vital in accelerating LID adoption and the solution to the city’s combined sewer overflow problem. “Everybody learning something at the same time costs money.” But upon his retirement almost at the plan’s five year anniversary, Neukrug was seeing results as valuable stakeholder input was coming back to the utility which may alter and improve the plan’s execution over the next and final 20 years. In contrast, Ontario’s approach to LID has been quite different and a less inclined learning curve is expected. In fact, it is the absence of formal LID policy which seems to have informed a practice-first approach in Ontario from which formal policy will be developed. This under-the-radar experience also fueled the development of cutting edge LID tools which now distinguish the CVC as an expert throughout North America, such as their Grey to Green series of retrofit guides and the Low-Impact Development Stormwater Management Planning and Design Guide developed in partnership with the Toronto and Region Conservation Authority. 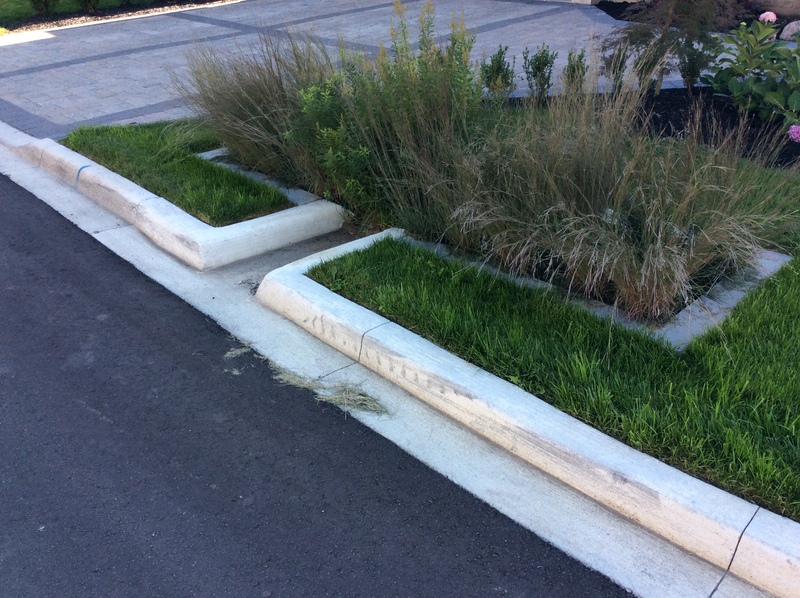 “[Retrofitting] positioned the municipality with experience and monitoring information that shows the performance of LID actually exceeds expectation and can work in clay soils and winter conditions, which are some of the misconceptions of LID application in Canada,” says Zimmer. As developers and consultants build local expertise in LID implementation and create efficiencies in execution, the financial return of LID for developers like Bianchi will only increase. Now with positive monitoring results over the past two years, the LID features of Wychwood are set to be assumed by the municipality. “Municipal assumption is anticipated for this coming fall,” Bianchi notes. Zimmer sees Ontario’s pending new guidelines as a “great win” and opportunity to encourage new innovators like Bianchi in the development and consulting communities. As with most new technologies, financial reward will come with maturity, but there are also rewarding opportunities in the new green economies which sweeping policy adoptions like these create. In Philadelphia, Neukrug has observed similar reactions to his policy shift, but also understands the extensive timeline behind any major municipal redevelopment scheme. What Philadelphia did to shorten this timeframe was institute stormwater fees based on property size and imperviousness, and in doing so, commoditized the rainwater. “We gave it a price, we gave it a value,” Neukrug says. “We also gave out credits. If you have a property that is five acres of concrete, it may be worth it to you to retrofit your property to better manage stormwater.” In implementing Green Cities, Clean Waters with its component parts — redevelopment regulations, parcel-based fee systems, grant and demonstration programs — Neukrug created new micro-economies which developers, anti-developers or consultants can exploit for their benefit. In the five years since Philadelphia’s Green Cities, Clean Water plan has been in place, public and private developers have added over 1,100 green stormwater tools to the landscape. Like Christine Zimmer, Tim Van Seters sits on the vast stakeholder advisory and review council which the MOECC has convened to inform the development of the new guidelines. The council consists of staff from the provincial government (MOECC, Ministry of Natural Resources and Forestry, Ministry of Transportation, Ministry of Municipal Affairs and Housing), federal government (Environment and Climate Change Canada), municipalities, conservation authorities, academia, non-government organizations and professional organizations such as BILD, the Water Environment Association Of Ontario and the Association Of Municipalities Of Ontario. In the days following the release of the 2015 interpretation bulletin, the MOECC sought bids from consultant teams to help create the new Low Impact Development Stormwater Management Guidance Manual as well as develop provincial runoff volume control requirements and selection criteria for water budgeting and quality modelling tools. In a statement released to Building via email, the MOECC acknowledges the release of the new Manual may be delayed beyond initial projections. “The ministry anticipates that it will be finalized late this year or early 2017. A roll out strategy will be developed at a later date.” Additional consultation with the broader stakeholder community is expected, likely through the Environmental Registry, prior to release of a final document. Howard Neukrug believes the decentralized approach of LID improves stewardship of the environment but also restructures the costs of development more appropriately: “The policy in the United States for hundreds of years has been you take your waste and send it to the river. That has an appearance of no cost – there is no cost to the utility, there is no cost to the developer. But there is a big cost to the environment. If you consider the environment in that equation, you are transferring the cost to a place where, once waste is in the river, it is very hard to clean up.” LID, he believes, suitably relocates developments costs to where they are incurred. Despite the differences between Philadelphia’s and Ontario’s adoption of LID, in either a policy-first or practice-first approach, both suggest LID offers some short-term pain in exchange for long-term gain. An initially steep learning curve exists, and an uncomfortable redistribution of costs (or perceived costs) must occur, but once the industry normalizes after approximately five years of trial, the benefits of LID become apparent: increased value of development properties and more livable communities. Andrew Sobchak, P.Eng., is principal of Toronto-based Tributary Consulting and has worked for 17 years in the water resources industry. Wychwood at Upper Churchville, a 70-lot estate subdivision in Brampton, Ont., is one of the province’s first to provide stormwater management control entirely through low-impact development practices. The projects includes lot-level controls, such as impervious surface reduction and permeable paver driveways, and development-level controls such as bioswale conveyance, infiltration trenches and landscaped rain gardens. These measures direct rainwater and runoff underground wherever possible, closely mimicking the pre-development hydrologic function of the property. Its not all sunshine an unicorns with LIDs: the MOECC LID guidance documents states blanket (arbitrary) targets across all watesheds, catchments and sewersheds, using rainfall statistics as a substitute for watershed science. The MOECC targets are 3 to 7 times greater than local targets determined through advanced subwatersheds studies using coupled surface and groundwater models that cost 10 times more than the MOECC LID guidance contract. Those inflated (unsupported?) targets will have a significant lifecycle cost to municipalities and taxpayers – in fact, the present value of the low impact approach has been calculated as over 500% greater than conventional servicing based on long term O&M and replacement. So weak science and inflated cost. Sounds like green energy in Ontario and we know how that is working out in terms of costs for consumers. The article misses the history on LID implementation in Ontario. It is not new. My first LID was conceived in the early 1990’s in a servicing plan in York Region and was in constructed by the late 1990’s – but it has never been maintained or inspected by the municipality since. MTOs research on the benefits of swales was done in the late 1980’s and we used Schueler’s 1987 manual to specify LIDs in subwatershed studies in the early 1990’s before there was an Ontario manual. Yet somehow green infrastructure is considered a panacea for municipalities and considered easier to maintain than a centralized end of pipe facility (where it is easier to track asset data, easier to inspect and document, and significantly more cost effective to maintain on a unit basis). Luckily some municipalities are doing a reality check on the implementation costs and asking MOECC serious questions about the guidance that is supposed to apply equally to new development and retrofits – even if those retrofits will adversely impact existing infrastructure (e.g., infiltrated LID runoff can increase basement flooding and pumping and treatment costs in partially separated sewer catchments stresses by extraneous infiltration, and infiltrated chlorides from road salt can accelerate the deterioration of cast iron and ductile iron watermains and fitting (lower soil resistivity means corroding iron and burst pipes .. expensive to repair on an emergency basis). Look at the sunshine an unicorns only (the feel so good infographics and tweets) and forget about the what’s under the surface and we are in for a world of hurt/regret with LID green infrastructure. That cost is $330B (initial capital only, no long term O&M or replacement), which is about 50 times greater than the Ontario stormwater infrastructure deficit. That is using a unit cost of about $400,000 per hectare. Using other incremental unit costs ($1.3M / km of road based on recent tenders) and the Ontario wide cost is even higher. Using costs attributed to Neukrug, the former CEO of Philadelphia Water cited in the article, of $200,000 per hectare for private sites and $1M per hectare for public ones and you see these Ontario cost estimates are realistic in magnitude … but of course unrealistic in terms of funding and implementation. (Check out this 2017 TRIECA presentations for more on those unit costs: http://trieca.com/wp-content/uploads/2016/07/7-A-2-Kyle-Vander-Linden-Tracy-Patterson-Cash-Strapped-Why-a-New-Business-Model-is-Needed-for-M.I..pdf ). What does the MOECC guidance say about LID implementation cost? It says “Excessive costs shall not be a constraint”. Wow! The article lists a lot of stakeholders, perhaps implying they are all on board with the statements on the interviewees. My review of the stakeholder comment records indicates that cost is a consistent concern among the stakeholders including BILD, MEA and others. The MOECC response to the cost concern? Nothing. So the interviewees in the article are providing only one stakeholder perspective. If people in Ontario are not happy about paying for Smart Meters that over promised and under-delivered green energy promises, they will be equally unhappy about “smart ditches” or LID ‘smart sewers’s and what they do to municipal finances. One municipality has estimated that its stormwater utility fee would have to increase from about $50 per year to $850 to pay for LID implementation .. .that is more than a typical water bill. And do we need LID in all watersheds, sewersheds like MOECC has proposed? Do we have universal stormwater problems to address? The first sentence/paragraph of the article suggests that there is something seriously wrong with conventional drainage and how it is affecting water balances. But what does the data on streamflows say? Has conventional servicing without LIDs derived groundwater systems of recharge and depressed baseflows in our stream? No. The opposite. The recent Source Protection assessment report for the Toronto area states that contrary to popular wisdom (urban myth?) there has been no baseflow declines. This funding is echoed by earlier studies by BILD. So is there a water balance crisis needing LID intervention? Not really. Do we have a universal flooding crisis to address with LIDs? Or is flooding concentrated in specific areas requiring specific solutions? From sewage back-ups to overland flooding risks, detailed spatial analysis shows that these issues are not universal and losses are concentrated in specific areas that can be explained by monitoring of infrastructure performance and advanced modelling of surface and infrastructure systems. Smart municipalities have prioritized these areas and are focusing improvements on these specific areas. But the MOECC LID guidance proposes LIDs EVERYWHERE – NO MATTER WHAT IS HAPPENING. The LID guidance applies to roadway resurfacing projects in neighbourhoods built in the 1980’s and 1990’s with robust drainage systems and in many cases centralized treatment in ponds, or quantity ponds retrofitted for quality treatment. And robust monitoring studies by MOECC and others show these facilites can meet provincial performance targets (e.g., MOECC demonstration pond in York Region). But the MOECC guidance would impose LID even in areas that are already treated and have no flood risks/reports. So we have an unaffordable universal LID solution to problem that does not exist in many areas and a solution that can aggravate existing problems (basement flooding is highest in high infiltration areas based on flood reports in Toronto from 2000, 2005 and 2013). LIDs will increase infiltration stresses and flooding risks in some areas. What about water quality and what LIDs can do for that? They reduce runoff and can keep phosphorus out of rivers and lakes. But at a cost of $18,000 per kg reduced compared to $50 per kilogram for rural best management practices, who would ever choose LIDs and urban runoff as the most effective solution? Maybe someone to whom ‘excessive cost is not a constraint”. If urban areas have a phosphorus loading problem then ban fertilizer application (like we did with cosmetic herbicides) instead of building expensive infrastructure (green or grey) to treat it. That would be real source control. Maybe its time for and article that digs below the surface on LIDs? Time to look broadly at costs and impacts to other infrastructure. Otherwise we can just get out our cheque books. One more point to add on the article and promised cost savings is that Philadelphia has unique system issues and many cities with CSOs (combined sewer overflows) can find LIDs could displace otherwise costly storage infrastructure. But only a fraction of urban catchments in Ontario have CSO’s and would benefit from LID solutions – areas without CSO problems will have to pay full freight for LIDs but without the cost offsets / benefits under the MOECC policy. But even when a city has a CSO issue to address, LID may not be the solution. An example of this would be the Toronto Don River CSO control – over $1 billion will be spent on a diversion tunnel around the Coxwell sewer to store wet weather flow and virtually eliminate CSOs in parts of the Don and harbour. The propsoed system of shafts and tunnels (grey infrastructure, not green) is ALSO needed for operational flexibility so the Coxwell sewer can be taken offline for inspection and servicing. The MOECC LID policy would demand LID retrofits in the catchment at a cost of several billion dollars instead. And that would not address the operational imperative for a grey infrastructure diversion. LID solutions are great demonstration projects but not effective system-wide solutions to today’s pressing infrastructure challenges. Unfortunately the MOECC LID guidance has a narrow view of municipal infrastructure systems and is blind to cost realities and other operation priorities of municipalities. That 70-lot estate residential “subdivision” in Brampton, Ont. is just over 5 hectares in size. That size site is way too small for conventional end of pipe treatment which explains the choice of LIDs there. It would be more accurate to call it ‘infill’ than to call it a subdivision. It is not a scalable solution for typical large subdivisions. Also the densities achieve in the Sequoia “subdivision” appear to be less than half of sustainable development densities cities are targeting. So it is nice to have a few estate lots around to max out on LIDs but that is not normal. Typically sustainable hubs or transit corridors will have densities of 160 residents and jobs combined per hectare (served by light rail transit or bus rapid transit per the Place to Grow plan). So Sequoia falls far short of that. 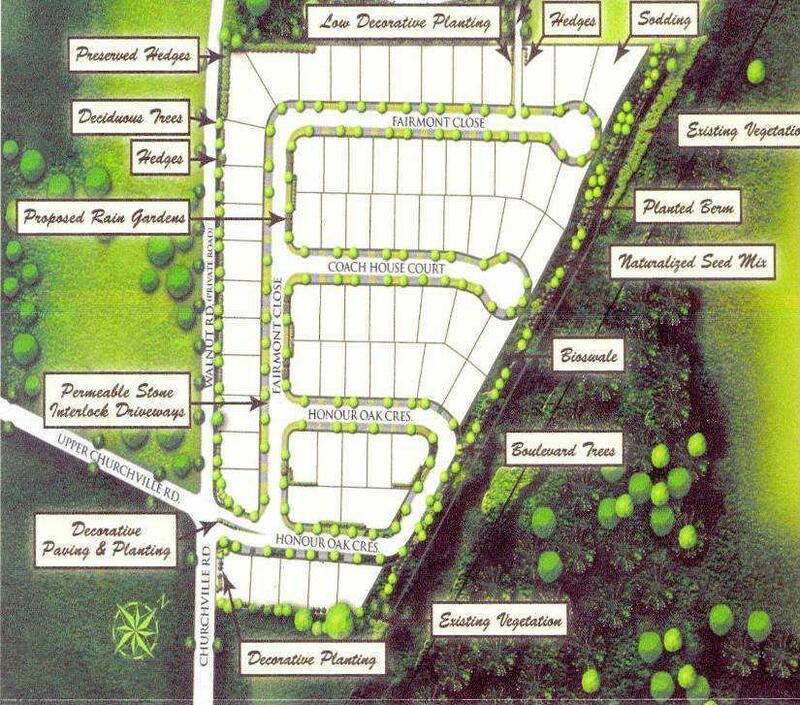 It is typical that estate residential subdivisions are used to demonstrate LID infrastructure savings – there are examples in the US in Arkansas and Wisconsin cited by USEPA where 1/3 acre lots are ‘sustainable’ with LIDs, but we don’t build large sustainable communities in Ontario with 1/3 acre lots or with the low Sequoia example densities.